The MAN and NEOPLAN brands deliver the qualities you would expect from a World-class Bus & Coach manufacturer: Efficiency, Innovation, Robustness and Customer Proximity. These qualities are founded on the reliability of our industry leading products and our customer focused service packages. Our product portfolio includes chassis and touring coaches designed with maximum efficiency, comfort and safety. In today’s modern world travellers want and require a relaxing and safe environment, at the same time they also demand their mode of travel delivers eco-friendly environmental compatibilities; at MAN all of these requirements are addressed in the NEOPLAN brands. Today’s coach operator wants to deliver passengers an unparalleled travel experience and in a MAN NEOPLAN Coach this combines premium design, industry leading sector innovation and exclusivity of the highest quality. In a NEOPLAN, passengers will experience luxury and convenience with all their senses – from the welcoming atmosphere of the spacious interior, to the panoramic views of the rolling countryside afforded through the deep glazed side windows, through to the audible experience they gain from listening to the top-of-the-range audio system. A NEOPLAN Coach allows passengers to tailor their personal travel comfort requirements to meet their requirements. With the ultimate customer experience in mind the entire MAN NEOPLAN range is designed to meet the individual operator’s premium needs. Tailored to meet individual and exacting requirements, down to the finest detail, the NEOPLAN is the perfect brand for exclusive connoisseur travel of the highest quality. Relax and enjoy the journey with NEOPLAN. Providing an elegant and flexible mode of travel, whether as a premium bus, coach or long-distance coach, the NEOPLAN Tourliner sets new standards with its blend of perfect aerodynamics and fascinating design elements. Precise contours and clear lines, both inside and out, clearly demonstrate fascinating design elements ensuring individuality and a feeling of wellbeing. The Tourliner’s state-of-the-art interior design, featuring quality materials, contemporary colours and a new lighting concept, create a harmonious sense of space, while at the same time setting new standards in passenger comfort. The new and sophisticated design of the over-head luggage racks help enhance and create a visual highlight, at the same time they provide more space and are easier to access. User-friendly overhead service sets, with individual climate control and multi directional ventilation outlets, guarantees passengers a personal delivery of fresh air. The Tourliner’s high quality, generously proportioned, driver’s workplace provides freedom of movement as well as enough storage space for day-to-day essentials. The ergonomically designed driver’s seat allows for maximum comfort and the high-quality multi-function steering wheel, combined with the optimally placed switches, are easy to operate all ensuring driver well-being and added safety. Safety, as with any Lion badged MAN vehicle, is key element across the NEOPLAN range. With state-of-the-art driver assistance systems and a reinforced skeleton, the Tourliner provides the highest level of safety in every situation. It also meets the ECE-R.66.02 strength of superstructures regulations. All NEOPLAN Coaches come equipped with, or can be specified with: Adaptive Cruise Control, Anti-Slip Regulator, Brake Assistant, Comfort Drive Suspension, Emergency Braking System and emergency brake hazard warning lights, Electronic Brake System, Electronic Stability Program, Dynamic Stability Program, Lane Guard System, maximum speed control management and cruise control, MAN EfficientCruise®, MAN EfficientRoll, GPS-supported cruise control, Maximum Speed Control, Roll Over Prevention, Tyre Pressure Monitoring, LED headlights, Service Interval calculator and Attention Guard. The Tourliner also delivers operational values. In using sophisticated, tried-and-tested engine technology, the Tourliner is both powerful and highly economical. As you would expect from any MAN product, the NEOPLAN meets the highest standards in terms of safety and economy. The sophisticated engines, all surpassing Euro 6 compliance, offer a robust and low lifecycle cost solution. 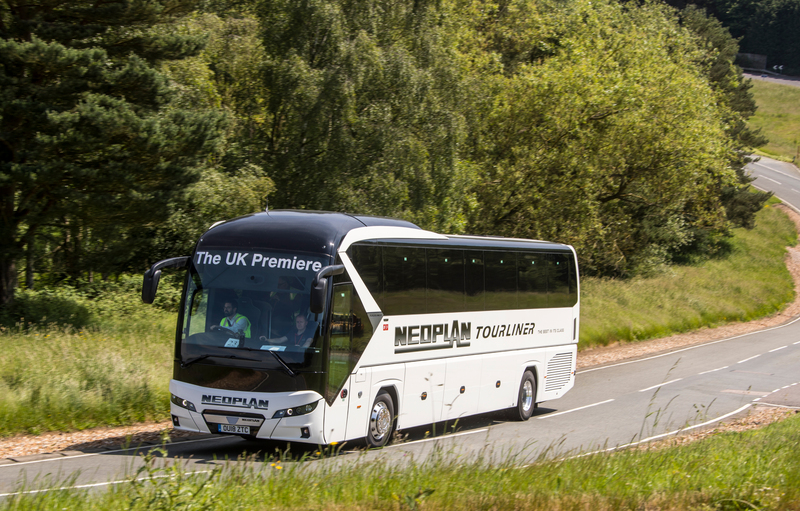 During recent trials, in comparison with the predecessor model, the New NEOPLAN Tourliner proved a 10 per cent reduction in fuel consumption, with a direct correlation in reduced emissions. Furthermore, the maintenance and repair costs have also been considerably reduced through changes to the vehicle body. Available with choice engine variants, ranging from 420 to 500 hp, the Tourliner offers a comfortable, balanced, economical and environmentally friendly driveline. All engine powers, 420, 460 and the 500, use the robust and service friendly MAN D2676, 12.419 litre, Euro 6 and 6c compliant, upright six cylinder, EGR and SCR equipped engine. With a choice of transmissions, Coach operators can specify a Tourliner to meet their operational needs. The choice of transmissions the Tourliner offers ensures a smooth and effortless drive allowing passengers a seamless journey. The Tourliner 4X2, two axle, can be specified with a 6-speed manual transmission (only with 420 hp, Tourliner 12 m) the MAN “TipMatic®” automated 12-speed manual transmission with “Easy-Start“, or a 6-speed automatic gearbox. The larger three axle, 6X2, Tourliner can be specified with either the MAN “TipMatic®“ automated 12-speed manual transmission with “Easy-Start“, or a 6-speed automatic gearbox (only with 460 hp). Both the two axle and the three axle Tourliners use a front axle that is Multi-linked with independent wheel suspension and stabiliser bars, the rear axle is a MAN hypoid axle with four location arms. The trailing axle of the 6x2 is fitted with longitudinal links and wishbones. Every NOEPLAN Tourliner is supported by a three year MAN Warranty, including an annual engine service (mileage restrictions apply) 4th year driveline, one year MAN Telematics and Fit To Go as standard. With a wide-ranging portfolio of services, MAN offer total piece of mind with a 360° level of support that is both efficient and reliable. With a range of Customer Services MAN offer everything a Coach operator needs, meaning that MAN coaches are always operated in the best possible condition and operators can profit from their vehicles for even longer. With MAN ServiceContracts or MAN Mobile24 an operator’s vehicles’ mobility is our primary concern. MAN services have tailored solutions on hand to optimise vehicle operation, increase profitability and increase efficiency. To ensure the driver gets the most out of an operators investment and is in tune with the vehicle MAN offers a MAN ProfiDrive® driver training programme, these coaching modules bring a driver up to speed with the latest enhancements, making day-to-day driving safer and more efficient. MAN Financial Services can offer a number of individual bespoke financially options tailored to suit operation and needs. Our commitment to service is supported by our pledge to offer a two-year warranty on MAN service and parts, this means the operator gets assured part availability, higher quality and long service life MAN Genuine Parts. MAN also offer MAN Genuine Parts ecoline, this offers operators a fully serviced reconditioned MAN Genuine Part. If a NEOPLAN suffers from an unfortunate breakdown MAN Truck & Bus UK, thorough MAN Mobile24 24-hour breakdown service, supports operators around the clock with an emergency roadside assistance. This ensures a fully trained MAN Technician will attend the breakdown 24/7, 365 days of the year. Through a series of expansion improvements MAN Truck & Bus UK is committed to delivering a dealer network which offers a customer centric approach. With an investment of £20 million planned for the next five years, which will include expansion re-openings and New Greenfield developments, all focused on further enhancing the customer experience, MAN is committed to delivering the highest levels of customer service and support. The New Greenfield sites will increase MAN UK’s points of sales and service representation. At Euro Bus Expo 2018 MAN Bus & Coach will present two NEOPLAN Coaches on stand G10, Hall 5. These vehicles showcase the qualities, practicalities and efficiencies you would expect from the MAN NEOPLAN Tourliner brand, firstly a 13.4 meter P20, and secondly a 13.1 meter P10. Catering for the used Coach market a MAN Bus & Coach The leading international exhibition for the bus and coach industrywill be on display outside the main hall. At MAN Bus & Coach TopUsed you get a lot for your money. All TopUsed vehicles are tried, tested and presented in an ‘as new’ condition. Checked and double-checked all MAN TopUsed vehicles are covered by the MAN TopCare scheme, a comprehensive repair and service package tailored around the requirements of our customers. All MAN TopUsed Coaches receive a thorough and stringent inspection and come with a 3, 6, 12 or 24 month TopCare comprehensive repair and service package. Additionally they come with Mobile 24 breakdown assistance, a range of tailored flexible leasing and financing options, as well as fixed maintenance and repair contracts.